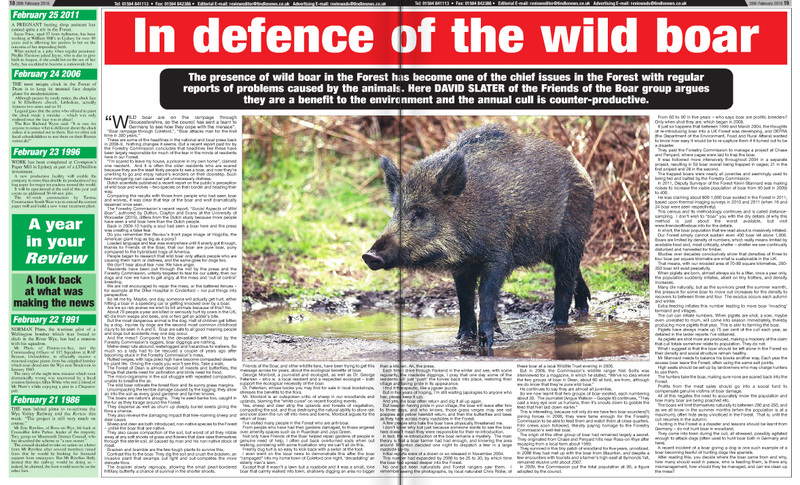 The presence of wild boar in the Forest of Dean has become one of the chief issues in the Forest with regular reports of problems caused by the animals. Here, David Slater of Friends of the Boar group argues they are a benefit to the environment and the annual cull is counter-productive. These are some of the headlines in the national and local press back in 2008-9. Nothing changes it seems. But a recent report paid for by the Forestry Commission concludes that headlines like these have been largely responsible for much of the fear in the minds of residents here in our forest. “I’m scared to leave my house, a prisoner in my own home”, claimed one resident. 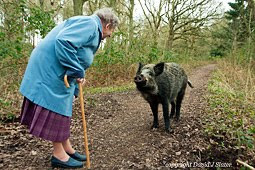 And it is often the older residents who are scared because they are the least likely people to see a boar, and now they’re unwilling to go and enjoy Nature’s wonders on their doorstep. Such fear-mongering can cause real yet unnecessary distress. Dutch scientists published a recent report on the public’s perception of wild boar and wolves – two species on their border and heading their way. Comparing the results with those from people who had seen boar and wolves, it was clear that fear of the boar and wolf dramatically lessened once seen; or “truth will out”. 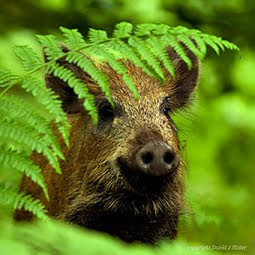 The Forestry Commission’s recent report, “Social Aspects of Wild Boar”, authored by Dutton, Clayton and Evans at the University of Worcester (2015), differs from the Dutch study because more people have seen a wild boar here than the Dutch people. Back in 2009-10 hardly a soul had seen a boar here, and the press was creating a false fear. Do you remember the Review’s front page image of Hogzilla, the American giant hog as big as a pony? And remember the worry that, “It’s only a matter of time before a child gets killed”, in the Forester? And then came the headline in 2010, “Warning after Wild Boar savages greyhound”. Loaded language and fear was everywhere until it slowly got through, thanks to Friends of the Boar, that our boar are pure boar, puny compared to the hybridised hogs of America. People began to research that wild boar only attack people who are causing them harm or distress, and the same goes for dogs too, like the greyhound. Boar in Europe are the same as ours, including at times, a tameness. We don’t hear about fear now. We have anger. Residents have been put through the mill by the press and the Forestry Commission, unfairly targeted to fear for our safety, then our dogs, and now we have to get angry at the mess and “out of control” breeding. We are not encouraged to repair the mess, or the battered fences (eg. The Dilke), nor put things into perspective. So let me try. Maybe, one day, someone will actually get hurt, either hitting a boar in a speeding car, or getting knocked over by a boar. Are we so risk averse we wish to kill animals because of this? No. About 70 people a year are killed or seriously hurt by cows in the UK! 60 die from wasps & bees. 1 or 2 get an adder’s bite. But the most dangerous animal is the dog. Half of children get bitten by a dog, and injuries by dogs are the second most common childhood injury to be seen in A&E. Boar are safe to all good meaning people and dogs, but accidents may one day occur. And the mess? Compared to the devastation left behind by the Forestry Commission’s loggers, boar diggings are nothing. Metre-deep ruts abound, waterlogged and hazardous to walkers. So much so a lady had to be rescued a couple of years ago after becoming stuck in the Forestry Commission’s mess! Rutted verges, with logs piled high (and dangerous), have become compacted deserts for plant life. Driving the roads you won’t see this. Take a walk! The Forest of Dean is almost devoid of insects and butterflies, the things that plants need for pollination and birds need for food. The micro-organisms in the soil struggle with repeated compaction, unable to breathe the air. How insincere and scientifically flawed were recent comments from Kevin Stannard about the boar threatening the butterflies. Butterflies require flowers on sunny forest rides - something his office destroys. And species like the small-pearl bordered fritillary requires young bracken, not the huge overgrowths we get thanks to his management. The wild boar rotivate the forest floor and its sunny grass margins (tracks and roadsides). Uncompacting the terrible damage caused by the logging, they allow air into the soil as every good gardener and farmer knows. The boars are Nature’s ploughs. They’re seed-banks too, caught in the fur as they forage around the forest. They disperse as well as churn up deeply buried seeds giving the flora a chance. The wild boar not only reverse the ecological disaster created by the Forestry operations, but they also reverse the damaging impact that free roaming sheep and deer cause. Sheep and deer are both introduced, non-native species to the Forest (unlike the boar that are native). They also cause compaction of the soil, but worst of all they nibble away at any soft shoots of grass and flowers that dare raise themselves through the sterile soil, all caused by man and his non-native stock of meat. Bracken and bramble are the few tough plants to survive this. Contrast this to the boar. They dig the soil and crush the bracken, an invasive and carcinogenic plant that swamps out light and out-competes the more delicate flora. The bracken slowly regroups, allowing the small pearl-bordered fritillary a chance of survival in the shorter shoots, contrary to Mr. Stannard’s belief. Friends of the Boar, and other wildlife fans have been trying to get this message across for years, about the ecological benefits of boar. George Monbiot, a journalist and ecologist, as well as Dr. George Peterken (also a local resident), a respected ecologist, both support the ecological necessity of the boar. Dr. Peterken, whose books you may find for sale in local bookshops, stresses the benefits to the flora. Mr. Monbiot is an outspoken critic of sheep in our woodlands and uplands, blaming the “white curse” on recent flooding events. Yes, sheep and deer strip the uplands and forests of vegetation, compacting the soil, and thus destroying the natural ability to store rain and slow down the runoff into rivers and towns. Monbiot argues for the return of boar. I’ve visited many people in the Forest who are anti-boar. From people who have had their gardens damaged, to those angered over amenity spaces, such as in Ruardean and Joys Green. Not only have Friends of the Boar helped repair gardens of people in genuine need of help, I often put back overturned sods when out walking, pondering with some frustration why we can’t all do this! Freshly dug turf is so easy to kick back with a swish of the foot. I even went on the local news to demonstrate this after the boar “rampaged” into my home town of Coleford one night, “devastating” an elderly man’s lawn. Except that it wasn’t a lawn but a roadside, and it was a small lone boar that calmly walked into town, shallowly digging an area no bigger than a kitchen. Ah, the press! Each time I drive through Parkend in the winter and see, with some regularity, the roadside diggings. I pray that one-day some of the residents will just “push” the turves back into place, restoring their village and taking pride in its appearance. I find it therapeutic like a jigsaw puzzle. But in 5 years of hoping, I’m still waiting (apologies to anyone of has, please keep it up). And yes, the boar often return and dig it all up again. But keep on having pride in your village, the boar will leave after 2-3 days, and who knows, those grass verges may see red poppies and yellow hawkbit return, and then the butterflies and bees, as they have across many roadsides in the Forest. A few people who hate the boar have physically threatened me. I don’t know why, but just because someone wants to see the boar here doesn’t mean they were responsible for their re-introduction! In fact, the re-introduction of the boar remains a mystery. The main theory is that a boar farmer in Abergavenny had had enough, and knowing the area around Staunton decided one night to dispatch a few in a large roadside lay-by. Initial reports were of a dozen or so released in November of 2004. This number had expanded by 2006 to be 25-30, by which time the boar had spread deeper into the forest. No one but keen naturalists and forest rangers saw them. I remember seeing the photographs (of local naturalist Chris Ridler) of these boars at a local Wldlife Trust evening in 2005. But in 2006, the Commission’s wildlife ranger Neil Sollis was interviewed for a magazine, in which he stated, “We’ve no idea where the two groups of boar in Dean, about 60 all told, are from, although we do know that they’re pure wild boar." He continues to say they are almost all juveniles. So we now learnt that 2 groups of boar existed, each numbering about 30. The journalist (Angus Watson – Google it!) continues, "They cast a wary eye over us humans, then it’s snouts down to gobble the feed that Neil laid down earlier". This is interesting, because not only do we have 2 boar sounders (?) joining forces in 2006, they were tame enough for the Forestry Commission to be able to feed them and watch them at close quarters. Film crews soon followed, literally paying homage to the Forestry Commission’s well-fed boar. The origin of this other group of boar had remained largely a secret. They originated from Chase and Penyard hills near Ross-on-Wye, after escaping a local farm about 1999. They survived in this tiny patch of woodland for 5 years, un-noticed. In 2006 they had met up with the boar from Staunton, and despite a few encounters with tourists and a farmer’s high-seat at Symonds Yat, remained elusive until about 2007. In 2009, the Commission put the totals population at 90, a figure adopted by the Council. From 60 to 90 in 5 years! Who says boar are prolific breeders? Only when shot they are, which began in 2008! It just so happens that between 1999 and March 2004, the thoughts of re-introducing boar into a UK Forest was developing, and DEFRA wanted to know how easy it would be to re-capture them if it turned out to be a disaster. They paid the Forestry Commission to manage a project at Chase and Penyard, where cages were laid to trap the boar. It was followed more intensively throughout 2004 in a separate project, resulting in 59 boar overall being trapped in cages; 31 in the first project and 28 in the second. The trapped boars were nearly all juveniles and seemingly use to being fed and baited by the Forestry Commission under Rob Guest. In 2011, Kevin Stannard suddenly proclaimed in his management strategy plan (2011-2016) that 60 boar were released at Staunton. This has gone unquestioned ever since. Also in 2011, Stannard was making noises to increase the viable population of boar from 90 (set in 2009) to 400. He was claiming about 800-1,000 boar existed in the Forest in 2011, based upon thermal imaging surveys in 2010 and 2011 (when 16 and 34 boar were seen respectively). This census and its methodology is legend as much as it is flawed. It continues and is called distance-sampling. I don’t wish to “boar” you with the dry details of why this method is just about the worst available, but do please visit www.friendsoftheboar.info for the details. In short, the boar population that we read about is massively inflated. Our Forest simply cannot sustain even 400 boar let alone 1,000. Boars are limited by density of numbers, which really means limited by available food and most critically shelter – shelter we see continually disturbed and harvested for timber. Studies over decades conclusively show that densities of 3-4 boar per square kilometre are what is sustainable in the UK. That means, with our wooded area of 70-80 square kilometres, 200-350 boar will exist peacefully. When piglets are born, almost always 6 to a litter, once a year only, the population suddenly inflates, albeit on tiny trotters, and density increases. Many die naturally, but as the survivors greet the summer warmth, the pressure for some boar to move out increases to recover the density to 3-4. The exodus occurs each Autumn-Winter. Extra feeding, as done excessively by the Forestry Commission for 12 years, inflates this number leading to more boar “invading” farmland and villages. Also, the mismanagement of the cull can inflate numbers. When piglets are shot, a sow (maybe even unrelated to mum) will come into season immediately, thereby producing more piglets that year. Such mismanagement is akin to farming the boar. Piglets have always made up 75% of the cull each year, as detailed in the larder reports I’ve obtained. As piglets are shot, more are produced, making a mockery of the claim that cull totals somehow relate to population. They do not. Piglets make great barbeques, and the Forestry Commission sells these direct to the customer. Older boars are sold to a game dealer in Hereford. These facts and others are never disclosed by the Commission. The lack of information, misinformation and even disinformation is a huge criticism of the Commission in its own recent study! What I suggest is that the boar should be left alone in the forest so their density and social structure remain healthy. Mr. Stannard needs to balance his books another way. Each year the excess boar leave the forest, often using the same exit points. High seats should be set up by landowners who may charge hunters to use them. The hunters take the boar, making sure none are scared back into the forest. Profits from the meat sales should go into a social fund to compensate genuine victims of boar damage. All of this negates the need to accurately know the population and how many boar are being poached etc. The boars will limit themselves naturally to between 200 and 350, and as we all know in the summer months (when the population is at a maximum), often hide away unnoticed in the forest. That is, until the cull resumes in the Autumn. Hunting in the forest is a disaster and lessons should be learnt from Germany – do not hunt boar in woodland! They come into town during the cull, all stressed, possibly agitated enough to attack dogs (often used to hunt boar both in Germany and here). A recent incident of a boar goring a dog at Lydney Park Hunting Estate is one such example of a boar becoming fearful of hunting dogs like Spaniels. From what I have now exposed, you decide where the boar came from and why, how many should exist in peace, who is feeding them, is there any mismanagement, how should they be managed, and can we all clean up the mess!